The Isle of Skye, or Eilean a Cheo (The Misty Isle) is the second largest and best known of the Hebrides, measuring approximately 50 miles (80km) by 25 miles (40km) in area. Located close to the Western seaboard off the Scottish mainland. The island is linked by the Skye Bridge. (The toll has now been removed). The island has been populated for around 1500 years with numerous prehistoric remains such as standing stones, stone circles and duns (forts). The isle was fiercely contested by the Picts, Vikings and Scots, all of whom heave left their marks on the island. The Macleods and MacDonalds are two of the great clans of Scotland which made Skye their home, neither supported the Jacobites uprising of 1745 so Skye escaped the devastation others areas endured. Bonnie Prince Charlie passesd through Skye on his run from government forces after he was defeated at the battle of Culloden in 1746. Today, Skye is a haven for bird watchers and botanists with a wide variety of fauna and flora, with lots of coastland, woodland, grassland, moorland and high mountains. Climbers can take in the breathtaking peaks and jagged ridges of the Cuillins, the most rugged, rocky and magnificent mountain range in Britain. The walker has numerous places to investigate this beautiful island from Duirinish, Vaternish and Trotternish in the North to Minginish, The Cuillin Hills and Sleat in the South. The Scottish Gaelic name for Dunvegan been Dun Bheagain. The village of Dunvegan sits at the head of Loch Dunvegan which stretches in from the The Little Minch, the body of water separating the Isle of Skye from the outer hebrides. To the North of the village is Dunvegan Castle, which is the oldest continuously inhabited castle in Scotland. The seat of MacLeod of MacLeod, chief of the Clan MacLeod has been there for over 800 years, and is just a 5-minute drive from the Tables. For a further 5 minute scenic drive you will reach the Coral Beach at Claigan with its combination of accessibility and white sand make it a very attractive option on a warm sunny day. The Isle of Skye has something for everybody whether you are just on a short break or a longer holiday. If you enjoy walking we have the Quiraing, The Maidens, The Coral Beach, Neist Point Lighthouse and the Old Man of Storr, each with an abundant array of wildlife and photographic opportunities to suit all tastes. For the more experienced “munro bagger”the island boasts 12 Munro’s. General sight-seeing or experiencing the islands natural beauty, culture and crafts The Tables Guest House is an excellent welcoming base for your visit. The castle is open from March 29th to 15th October 2013 and visiting times are Daily 10am to 5.30pm with last entry at 5pm. As well as the castle it is well worth talking a walk around the formal round garden and a trip on the seal boat to observe the seal colony. Leaving Dunvegan and travelling around the head of the loch you will pass a turning for Orbost Gallery,The Gallery is open every day except Sunday from 10am to 5:30pm April to October. Taking in the stunning scenary as you pass MacLeods Tables Mountains South &North on the left you arrive at Colbost. Here you will find Colbost Croft Musuem and the Renowned Three Chimneys Restaurant. Heading towards Glendale you can stop at Skye Silver and admire and buy silver jewelery. Beyond Glendale are the breathtaking cliffs at Neist Point and the lighthouse with a large variety of wildlife and sealife. 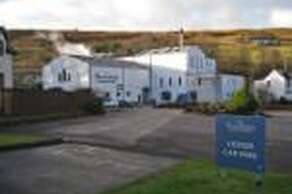 The only distillery on Skye is at Talisker sitting on the banks of Loch Harport with tours throughout the day. Trotternish is the northernmost penninsula on the Isle of Skye. 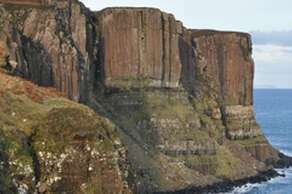 The Trotternish ridge is the result of a massive landslip thats runs for almost 19 miles. Two of the most interesting landmarks there are the Quiraing and the Old Man of Storr. Travelling up the West side from Portree and just before Uig is the Fairy Glen. At the top of the island you can find the Skye Museum of Island Life and the remains of Duntulm Castle. Moving round you pass Staffin Bay and at Elishader are Mealt Falls and Kilt Rocks. Passing the Old Man of Storr you arrive at Portree with its bustling market square. At the end of your day exploring Skye there are many places to eat, locally (Easter to October) we have the The Old School Restaurant, Waterside Bistro and the Dunvegan Hotel in the village to enjoy an evening meal and within a short drive are a number of other excellent places to eat including the Three Chimneys Restaurant. Portree is also within a 30 minute drive with an array of restaurants and take-away outlets. If you are looking for some local hospitality The Dunvegan Hotel is a focal point for villagers and tourists alike with its waterfront beer garden and terrace leading out from the Cellar Bar, where in summer guests can watch wonderful sunsets while enjoying a cool beer or relax with a drink in the cosy upper lounge bar with open views over Loch Dunvegan. Isle of Skye - Eilean a' Cheò. The Isle of Skye, or Eilean a Cheo (The Misty Isle) is the second largest and best known of the Hebridian islands, measuring 1,656 square kilometers in area (639 sq mi), (50 miles (80km) by 25 miles (40km)) meaning you are never far from the islands coastline. Located close to the Western seaboard off the Scottish mainland where the island is linked by the Skye Bridge. The island has been populated for around 1500 years with numerous prehistoric remains such as standing stones, stone circles and duns (forts). 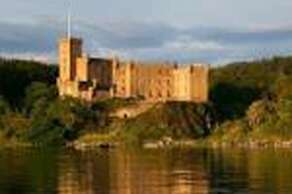 The isle was fiercely contested by the Picts, Vikings and Scots, all of whom have left their marks on the island. The Macleods and MacDonalds are two of the great clans of Scotland which made Skye their home, neither supported the Jacobites uprising of 1745 so Skye escaped the devastation others areas of Scotland endured. Bonnie Prince Charlie did pass through Skye on his run from government forces after he was defeated at the battle of Culloden in 1746.